Note: After the Kilauea volcano eruption in Hawaii, the American Red Cross mobilized to help those affected. 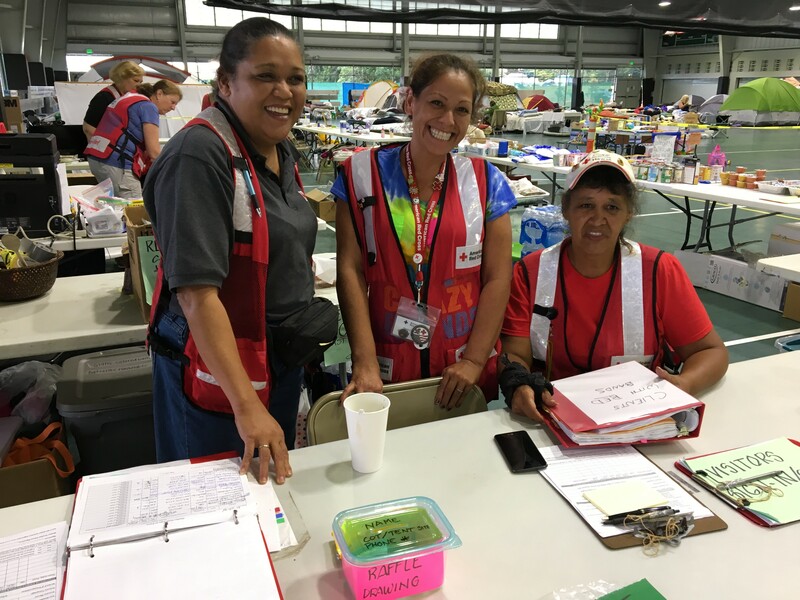 Red Cross volunteers from Hawaii – and others from all over the country- jumped into action to provide safe shelter, food, health services, mental and emotional support, recovery assistance and more. The following is a personal account from Kelly Frankiewicz, a volunteer with the American Red Cross Serving Orange County, who deployed in support of Kilauea volcano disaster relief. Supervising volcano evacuation shelters on the island of Hawaii was my first deployment as a Red Cross Shelter Supervisor. We were supplying four shelters at the time I arrived: two shelters that were four miles from Kilauea at Pahoa, and another two shelters at 11 miles out, near Kea’au. West coast mainland shelter supervisors were assigned in pairs to each shelter because there was a shortage of locally trained Red Cross Shelter Associates. Health Care Staff were splitting their service travelling between the shelters. Mental Health staff were assigned to the day shift only. Spiritual Care staff came from local sources. Our four shelters were located on state park lands, so there was acreage around them where many of our clients set up tents. We also had cots inside along with our registration desk, dining area and snack and client supply tables. The population of the four shelters ranged from 14 at the smallest to 90 inside and 250 outside at our largest shelter, which also had 40 dogs and 30 cats inside- plus 4 chinchillas, a goose, and a comfort chicken. As a night supervisor, serving 12-hour shifts from 7:00 p.m. to 7:00 a.m., my days were focused on sleep, shower, and a meal. Our Staff Shelter hosts, the Puna Covenant Church, were amazing! They brought us fresh lychee and papaya and took out our towels and personal laundry daily. My supervisory nights were occupied with compiling the necessary statistics like beginning and ending snack counts and population counts, as well as performing other tasks like sanitizing tables, assuring that the coffee and hot water pots remained full and hot, tidying the restrooms, and sanitizing and closing vacated cots. Visiting with our clients and local staff (we were well supplied with local Shelter Associates before I left) was especially pleasant – making friends and encouraging many people to volunteer and get trained with the Red Cross in Hilo. I was honored to be called Auntie Kelly.